A. Title: The 23rd Genesis Awards. Date: . Aired: Saturday 28 March 2009. 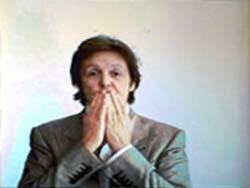 I dont know when or where Paul taped his message (I lifted the image below from a photograph taken at the ceremony).